These healthier almond sugar cookies are light and super satisfying, making them a better-for-you holiday dessert tray options. In a medium-sized bowl, whisk together flour, cornstarch, baking powder, and salt. In a separate bowl, cream together butter, egg, vanilla extract, almond extract, honey, and lemon juice. Add sugar to bowl with butter mixture and mix until well-combined. Pour wet ingredients into bowl with the flour mixture and stir until everything is just combined. Stir in chopped almonds until a cohesive dough has formed and all ingredients are mixed. If the dough is still exceedingly sticky, add additional flour a teaspoon or two at a time and mix in. Press dough into a rectangular shape approximately 1" thick and wrap snugly with plastic wrap. Refrigerate for at least one hour. Preheat oven to 350°F and line a baking sheet with parchment paper. On a nicely floured surface (and with a rolling pin coated in flour), roll out chilled dough to an approximately 1/8" thickness. 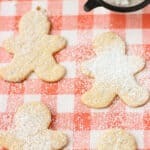 Cut out cookie shapes and place cookies on the parchment-lined baking sheets. Brush off any additional flour from cookies before baking. Bake cookies for 8-11 minutes, or until edges have slightly browned. Let cookies cool on pan for 2-3 minutes, then transfer to wire rack for cookies to cool completely. Once cookies have fully cooled, dust with confectioners' sugar for serving, or decorate with icing. Prep time includes approximately 2 hours for chilling. Adapted from Skinny Heart-Shaped Sugar Cookies by Amy's Healthy Baking.